Pumpkin for Dogs - What are the Health Benefits of Pumpkin for Older Dogs? Pumpkin for dogs, especially older dogs, has a lot of health benefits. This post takes a look at how we can use pumpkin to enhance the health of our oldies. You can also find a simple pumpkin dog biscuit recipe at the latter half of the post. Pumpkin is a healthy food that is rich in the antioxidant vitamins A, C, and E. It also contains vitamin K as well as a host of minerals, such as potassium, phosphorus, calcium, and copper. In addition, pumpkin is packed with flavonoid compounds, such as beta-carotenes, cryptoxanthin, lutein, and zeaxanthin. All these compounds are powerful antioxidants, which are free radical scavengers. They can help prevent cancer and slow down signs of aging. They are particularly good for the eyes (e.g. zeaxanthin can help prevent macular degeneration of the eye), the heart, and the skin. As you can see, pumpkin is a great food item for old dogs! What’s more, pumpkin is low in calorie (100 grams of pumpkin provides only 26 calories!) but high in dietary fiber. Adding this food to your oldie’s diet doesn’t contribute to weight gain, but the fiber can relieve both constipation and diarrhea. Pumpkin seeds are also highly nutritious. They are rich in the antioxidant vitamin E and minerals, such as zinc, manganese, magnesium, and copper. They are also a good source of protein. Interestingly, the unique proteins in pumpkin seeds are the source of many anti-microbial benefits (including anti-fungal and anti-viral benefits). Pumpkin seeds is also a good source of tryptophan, an amino acid. Tryptophan converts to GABA in the brain. As you may know, GABA has calming effects on the nervous system and can improve sleep. Another benefit for older dogs! 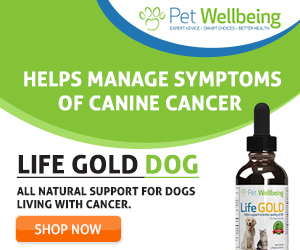 Pumpkin for Dogs – What are the Benefits? Pumpkin is good for diarrhea and constipation! If your dog suddenly develops mild diarrhea, or if he has mild constipation, a tablespoon or so of 100% pure pumpkin puree usually will do the trick. So keep a few cans of plain pumpkin in your pantry – they really come in handy! Since pumpkin is low in calorie but is extremely filling, it is beneficial for dogs who need slimming down. If your dog is a bit pudgy, talk to your vet and see if pumpkin can be used to replace part of the dog’s regular food. The beta-carotenes and zeazanthin contained in pumpkin are antioxidants that are beneficial to the eyes. They can help protect older dogs from developing age-related macular degeneration. Oils in pumpkin seeds contain nutrients that can prevent or lower the possibility of kidney stone formation. They also promote and support general urinary health. Dogs with urinary problems, such as incontinence or kidney stones, may benefit from having pumpkin or pumpkin seeds in their diet. Traditionally, raw pumpkin seeds have been used to treat tapeworms. 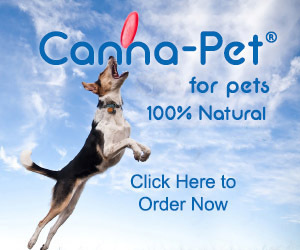 To treat dogs with tapeworms, use whole raw seeds and grind them immediately before feeding the fine meal to the dog. Depending on the dog’s size, 1/4 to one teaspoon of ground pumpkin seeds can be given for each meal. Alternatively, feed 1/4 to one teaspoon of pumpkin seed oil to the dog. Pumpkin for Dogs – How to Feed? Pumpkin goes well with cinnamon, which, like pumpkin, is a powerful antioxidant. Did you know that one teaspoon of cinnamon contains as many antioxidants as half a cup of blueberries? Cinnamon has anti-bacterial and anti-fungal properties as well. Cinnamon can be used for a variety of gastrointestinal problems, such as nausea, diarrhea, and flatulence. To reap the benefits of both cinnamon and pumpkin for dogs, mix a can (about 400 grams) of plain pumpkin with a teaspoon of ground cinnamon. Add a tablespoon or so (depending on your dog’s size) to your dog’s meal as a topper and this can protect and support your dog’s GI system. You can also sprinkle a few crushed pumpkin seeds on your dog’s food. Of course, pumpkin and pumpkin seeds can be used to make yummy dog treats such as biscuits and muffins. 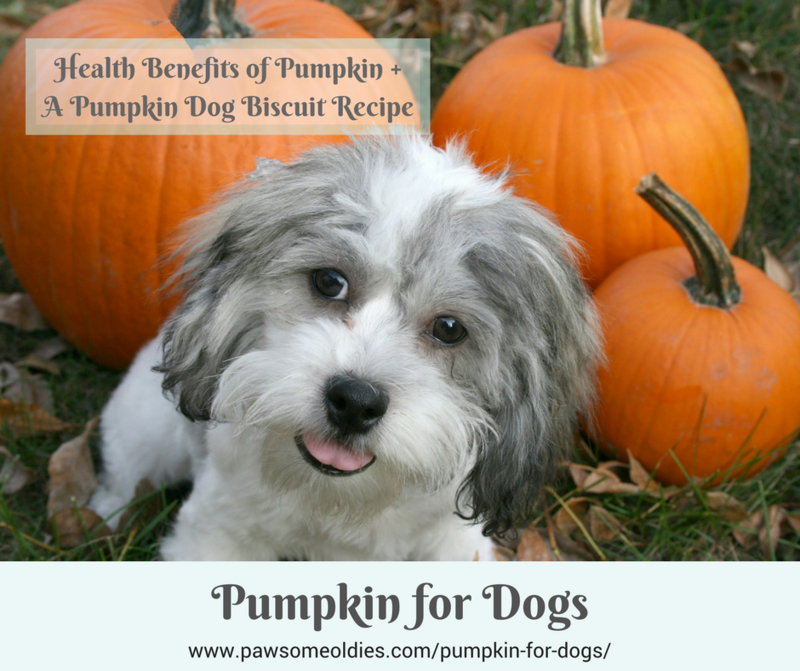 Here is a pumpkin dog biscuit recipe that makes easy and healthy pumpkin treats for your oldies. This recipe is a winner! 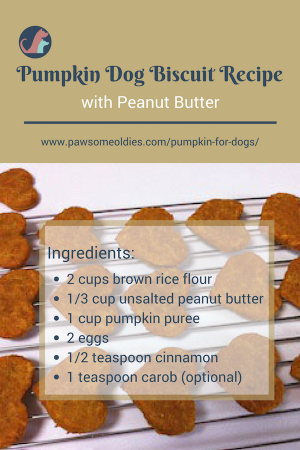 It uses two tasty ingredients (pumpkin and peanut butter) that most dogs love! In addition, brown rice is extremely nutritious. It is an excellent source of manganese, and a good source of selenium, phosphorus, copper, magnesium, and niacin (vitamin B3). It is rich in fiber and protein as well. Brown rice also has antioxidant properties and is good for the cardiovascular system. The magnesium in brown rice works with calcium to produce strong bones. So… this biscuit not only tastes good, but also is extremely healthy especially for older dogs. Good for the heart, the eyes, and bones. Preheat oven to 360°F (180°C) and line a baking sheet with parchment paper. In a large bowl, mix the flour and cinnamon (and carob if used). Put the dough between two sheets of saran wrap. Press it down a bit, and roll it out to approx. 1/4″ thick. Cut with cookie cutters of your choice. Turn the oven off and allow the biscuits to cool inside the oven completely before removing.